For the present of a perfect guest, stock up of these flashing LED bumpy ring in color pink . 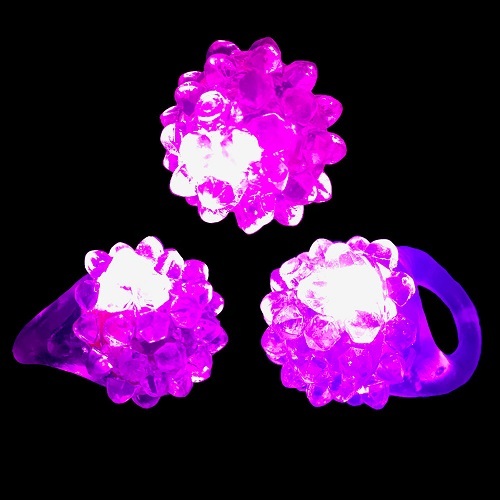 These rings, besides being carried in your fingers, can also be used as accessories of table decoration, as elastic with hair because they are made by silicone, a stretchable product. Sold in a box of 24, they are an excellent value for your money. The luminosity can last more than 24 hours. To activate the twinkling pink light, simply pinch the ring. This bright product will be very popular with the girls within the framework of them Sweet 16 , with bachelorettes, during thoroughly levying for the breast cancer or event with pink theme. The very comfortable and light rings are because they weigh less than 2 eleven. This bright product is not recommended for children under 5 years old.